1779 Mass. Ave. NW, Washington, D.C.
One hundred years ago this month, German forces launched the first major chemical weapons attack on the battlefields near Ypres, Belgium. The new film, “Winds of Chemical Warfare,” traces the history and the human impact of chemical weapons; with a special focus on the 2013 Sarin gas attacks in Syria and the multinational operation to remove the Assad regime’s deadly chemical arsenal. Andrew Weber, former Assistant Secretary of Defense for Nuclear, Chemical, and Biological Defense Programs. To save your seat, please RSVP by April 27. Green Cross International (GCI), founded by Mikhail Gorbachev in 1993, is headquartered in Geneva, Switzerland with national affiliates in thirty other countries, including Washington D.C. GCI responds to the combined challenges of security, poverty and environmental degradation to ensure a sustainable and secure future. 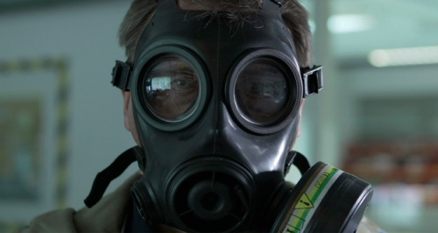 "Winds of Chemical Warfare" produced by SEPPIA Film & Domino Production with ARTE GEIE, RTBF, & YLE.